Alice will explore the classical music scene in American during the 19th century (1820-1880) placing composers Anthony Philip Heinrch, George Felix Benkert, and John Philip Sousa, and their compositions for string chamber music, within the larger context of American musical culture. The recital includes Heinrich’s “The Yankee Doodleiad”, an extravagant patriotic piece for strings and piano, (a possible world premier?) Benkert’s Quartetto in Eb, and piano songs arranged for violin and piano by Sousa. Baroque violinist Alice Culin-Ellison is a 4th-year doctoral candidate at Case Western Reserve University in the Historical Performance Program, studying with Julie Andrijeski. 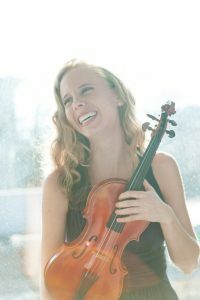 She regularly performs as a soloist with the CWRU Baroque Orchestra, and rotates as concertmaster of that ensemble, including leading CWRU’s production of Handel’s Acis and Galatea. Since earlier repertoires are a large part of her studies, she plays violin and viola in the Renaissance Violin Band, vielle and rebec in Collegium Musicum, as well as Renaissance sackbut. Her current research focuses on the beginnings of violin fingerings in the 18th century, and American string chamber music of the 19th-century. Alice has received several awards including a 2017 Career Center/Humanities@Work Scholarship through the CWRU Baker-Nord and Career Centers, a 2015 Early Music America Summer Scholarship, and the Jason Paras Memorial Scholarship at Indiana University. Previous degrees include an M.M. in Historical Performance from Indiana University , and a B.M. from the University of Michigan. A regular member and recently named Co-Artistic Director of Bourbon Baroque, Louisville’s period instrument orchestra, Alice’s professional engagements also include the Indianapolis Baroque Orchestra, Apollo’s Fire, and the Princeton Festival Baroque Orchestra, and other baroque and modern orchestras across the United States. She has performed in Canada, France, England, China, and Japan, and participated in music festivals under the direction of Christophe Rousset, Christian Curnyn, Philippe Herreweghe and Jeanne Lamon. This event is free and open to the public. Paid parking available at the meters along Bellflower Road or East Blvd. or in the Ford Ave. parking garage.